This hands-on science activity is great for those really cold days this winter and perfect for children 7 and up! As with all science activities, safety is extremely important! Parent supervision is required. Note: Do this experiment when it is 9 to 12 degrees outside. Measure out 1 cup of liquid dish detergent. Pour it into the mixing bowl. Measure out 1/2 cup of corn syrup. Pour it into the mixing bowl. Measure out 3 cups of water. Pour it into the mixing bowl. Stir until the ingredients have mixed together. Pour a portion of the bubble mixture into a separate cup. Bring the cup and a bubble wand outside. Run the wand through the air so that a bubble can form and fall to the ground. Make sure you capture it with the wand. You’ll be able to see the bubble crystallize and freeze within the span of minutes. In this experiment, you have created a bubble solution out of dish soap and corn syrup. The dish soap and corn syrup for a special polymer solution. When you blow a bubble, there is a layer of water molecules between two layers of the polymer solution. This is extremely important. When you go outside and blow a bubble when it’s as cold as 9 to 12 degrees Fahrenheit, the layer of water molecules will freeze well before the two layers of the polymer solution can burst. 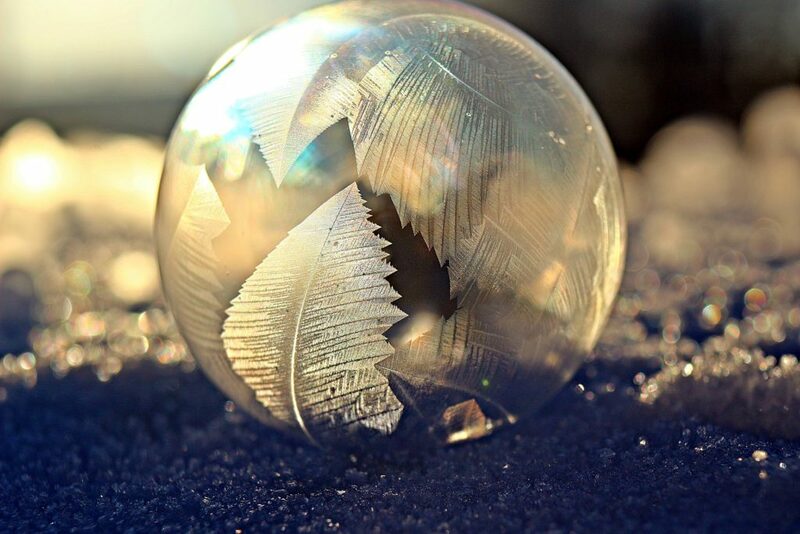 When the bubbles hit the extremely cold outside air, you’ll notice that the skin begins to crinkle like a plastic bag because the air on the inside of the bubble starts to contract almost immediately. Since you formed the bubble solution out of a polymer solution, the layers of the polymer solution are strong enough to support the frozen wall of water molecules. Polymer – (n.) a large molecule comprised of repeating smaller structural units. Molecule – (n.) is a group of two or more atoms that stick together.